Now that President Trump has pulled the U.S. out of the Iran deal, the mainstream media is continuing to present the JCPOA as they have for the past month—without telling the viewers all the facts about the deal. For example, the Washinton Post fact checker claimed on Tuesday that Iran would never build a nuclear weapon because they reduced the number of centrifuges to 5,060. The reduction is true, but according to former deputy director of the CIA Mike Morell 5,060 centrifuges gives Iran enough enrichment capacity to produce bombs but not enough for a peaceful power program. John Gambrell of the Associated Press wrote a one-sided anti-Trump article about Iran and the JCPOA without mentioning that the AP discovered a secret side deal that allows Iran to upgrade and modernize its centrifuges thus increasing its enriching capacity, all before the deal officially expires. 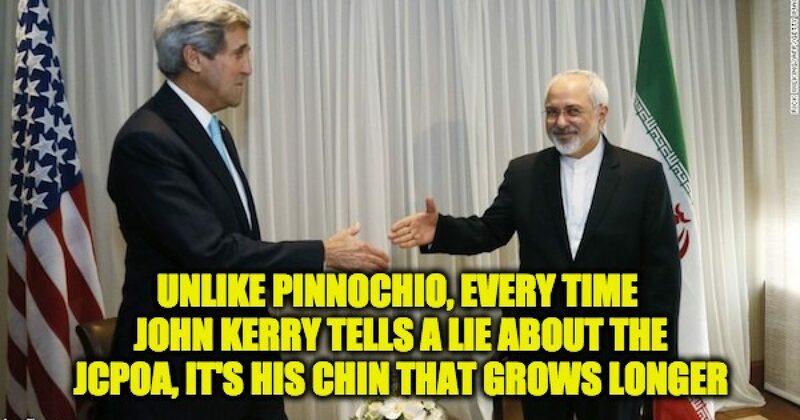 Former Secretary of State John Kerry made a speech in Italy today saying that Iran was compliant with the deal and all of the promised inspections are being done. That too is a lie. Former President Obama is also lying about the JCPOA details and Iran’s non-compliance. And no one is mentioning the suspicious activity at the Fordo nuclear site. The media isn’t giving you the facts but here’s an easy way to get them for yourself. There are four posts teased below (there’s too much information to put it all in one post). Each claim in each post links to major media sources, the text of the JCPOA, and/ or recognized nuclear weapon think tanks to prove it’s veracity. By reading the posts below, and you will understand what the media isn’t telling you and/or what they aren’t being truthful about. https://lidblog.com/why-president-trump-should-kill-jcpoa/ America was misled by former President Obama, former Secretary of State Kerry and their cronies when trying to sell the JCPOA to America. Additionally, parts of the deal were hidden from the public, and the Obama administration lied to America about other parts. Heck, the administration admitted it, in a New York Times Magazine piece Ben Rhodes explained how he led the administration’s efforts to misrepresent the truth in order “to sell” the JCPOA to the press. This post fills in the blanks. https://lidblog.com/claim-iran-complying-with-jcpoa/ Whether you agree with the President’s decision or not, any claim that we should stay in the deal because Iran is complying with the JCPOA is simply not true. In some cases, we know that Iran has violated the terms of the deal, in other cases, the IAEA hasn’t done its job so we don’t know if the rogue regime is compliant. https://lidblog.com/netanyahu-proves-iran-lied-jcpoa/ Using information secretly gathered from Iran and verified by the United States, Israeli Prime Minister Binyamin Netanyahu exposed a major lie in the information the Iranians supplied to the International Atomic Energy Agency (IAEA). That data was a required to be turned over before the JCPOA could be implemented. In other words, the entire agreement was based on a lie and should never have been implemented.